CORTE MADERA, Calif.--(BUSINESS WIRE)--Oct. 27, 2017-- RH (Restoration Hardware Holdings, Inc. – NYSE: RH) announced today the opening of RH Toronto, The Gallery at Yorkdale. RH Toronto represents the latest iteration of the brand’s design galleries and its continued foray into hospitality with a seamlessly integrated culinary offering by celebrated restaurateur and founding president of RH Hospitality, Brendan Sodikoff, which includes the RH Courtyard Café and Barista Bar. Commanding four levels and nearly 70,000 total interior and exterior square feet, this innovative retail concept features artistic installations of home furnishings in a gallery setting, including entire floors dedicated to RH Interiors, RH Modern and RH Outdoor. RH Toronto also includes an interactive Design Atelier, offering professional interior design services in a studio environment. “The vision for our new design galleries has been to blur the lines between residential and retail, and create spaces that are more home than store. 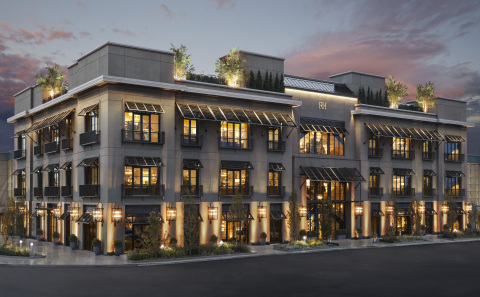 The next logical step was to further blur the lines between home and hospitality, with an integrated restaurant, wine and coffee bar,” says RH Chairman & CEO Gary Friedman. Sodikoff is the founder, CEO and creative director of Hogsalt Hospitality, a rapidly growing Chicago-based restaurant group spanning 14 concepts and 15 locations. Hogsalt’s portfolio includes nationally acclaimed establishments Au Cheval, Bavette’s, Doughnut Vault, and Gilt Bar in Chicago, as well as his first restaurant in New York – 4 Charles Prime Rib, an intimate supper club in the West Village. Sodikoff has been named one of Chicago Magazine’s “100 Most Powerful People in Chicago” and one of Crain’s “40 Under 40.” He has also been recognized by Bon Appétit, Food & Wine, and the Food Network, among others. “I've felt a connection to Toronto for years. It's a city of innovation and inspiration. I'm excited to join Toronto’s vibrant restaurant culture and look forward to spending more time there with the opening of RH,” Sodikoff said. RH Toronto marks Friedman’s ongoing collaboration with design architect James Gillam of Backen, Gillam & Kroeger, a firm recognized as one of Architectural Digest’s Top 100 architect and design firms in the world. Conceptualized as a grand-scale contemporary structure filled with fresh air and natural light, RH Toronto features an expanse of glass-and-steel French doors that open onto a streetscape with Boston ivy, geometric topiaries and towering trees rising out of a continuous boxwood hedge. The gallery’s eastern entrance within Yorkdale Shopping Centre features a beautifully-terraced façade of Venetian plaster and a lush interior courtyard flanked by dramatic open-air loggias serving as the central location for the gallery’s hospitality experience, the Courtyard Café. Here, guests can sit beneath heritage olive trees and a 140-foot-wide skylight that washes the entire space with natural light while they enjoy a seasonal, ingredient-driven menu accompanied by a curated selection of artisanal wines and craft beers. This all-seasons oasis features elegant banquette seating layered with green velvet boxwood hedging, cascading English ivy, trickling fountains, glimmering lanterns and 19th C. Rococo crystal chandeliers. Arriving to the gallery from the west, visitors will pass through a 24-foot-wide by 24-foot-tall threshold of glass and steel.Continuing into the gallery’s central hall with soaring 14-foot ceilings, guests will find the RH Barista Bar – a dramatic focal point defined by a Tuscan colonnade and facet-edged limestone slabs. Here, skilled baristas approach coffee as an art, and guests can enjoy fresh house-made doughnuts and pastries.Barrel-vaulted passageways lead to a classical arrangement of rooms featuring RH Interiors collections from internationally renowned artisans and designers. Continuing their journey to the upper floors, visitors will ascend a grand double floating staircase spanning nearly 40 feet. Natural light emanates from a second massive skylight four floors above, while a spectacular installation of 23 crystal Helix Chandeliers hanging 62 feet overhead highlights a composition of gilded antique mirrors cascading down the stairwell to create an endless reflection and further illuminate the way. Level two features the RH Design Atelier – a 5,000-square-foot studio anchored by four, 15-foot custom tables offering a fully integrated workspace for customers, designers and architects to reimagine one room or an entire home, inside and out. Here, guests can work with a team trained in the RH design ethos to create functional and elegant spaces. A place for collaboration and ideation, the Design Atelier features access to RH’s vast library of fabrics, leathers and furniture and lighting finishes – providing an unprecedented level of design services. On the third level, visitors will discover a 12,000-square-foot exhibition space presenting RH Modern, one of the largest curated and fully integrated assortments of modern furnishings, lighting and décor under one brand in the world. Developed in collaboration with a select group of acclaimed global designers, RH Modern’s design vernacular represents a fresh and innovative point of view, defined by a minimalist aesthetic, the finest materials and maximum comfort. This immersive experience is punctuated by a rhythmic progression of glass and steel French doors with corresponding Juliet balconies that line the perimeter of the floor. At the top of the grand stair, guests will arrive at the Conservatory & Rooftop Park. The 12,000-square-foot garden space will first be experienced within a structure of glass and steel with towering banana palms, heritage olive trees, exotic succulents, and 20-foot ceilings at its apex. The indoor space opens onto a spectacular rooftop with mature Himalayan birch trees set within colossal steel planters accented with cascading English ivy. This one-of-a-kind destination features open-air pavilions, glimmering chandeliers and trickling fountains that further enhance intimate vignettes of RH Outdoor collections and frame iconic views of the Toronto skyline. RH Toronto, The Gallery at Yorkdale is located at 3401 Dufferin Street and can be reached at 416.322.9422. Hours of operation will be Monday through Friday from 10am to 9pm, Saturday 9:30am to 9pm, and Sunday 11am until 7pm. RH (NYSE: RH) is a curator of design, taste and style in the luxury lifestyle market. The Company offers collections through its retail galleries, source books and online at RH.com, RHModern.com and Waterworks.com. This release contains forward-looking statements within the meaning of the federal securities laws, including statements related to the innovative retail concept and integrated hospitality experience at RHToronto, The Gallery at Yorkdale, statements regarding the level of design services offered at the RH Design Atelier, statements regarding the Conservatory & Rooftop Park being a one-of-a-kind destination, and similar statements. You can identify forward-looking statements by the fact that they do not relate strictly to historical or current facts. We cannot assure you that future developments affecting us will be those that we have anticipated. Important risks and uncertainties that could cause actual results to differ materially from our expectations include, among others, risks related to the number of new business initiatives we are undertaking; our ability to introduce new products and merchandise categories that will be of interest to our customers and to new customers; as well as those risks and uncertainties disclosed under the sections entitled “Risk Factors” and “Management’s Discussion and Analysis of Financial Condition and Results of Operations” in RH’s most recent Annual Report on Form 10-K filed with the Securities and Exchange Commission, and similar disclosures in subsequent reports filed with the SEC, which are available on our investor relations website at ir.restorationhardware.com and on the SEC website at www.sec.gov. Any forward-looking statement made by us in this press release speaks only as of the date on which we make it. We undertake no obligation to publicly update any forward-looking statement, whether as a result of new information, future developments or otherwise, except as may be required by any applicable securities laws.